I went to the pictures with Mary and Aine last night. Mary's colleagues had recommended "Little Miss Sunshine", and we had a ball. I haven't laughed so much in a long time. The story is very funny, also very sad, and full of love. It's the story of a family on their way to a beauty pageant. Olive, the 7-year-old daughter, has qualified for the final of the beauty pageant (God knows how - she is cute, but she is not the type of beauty you'd normally encounter at those events), and they all head to California in their minibus. A lot goes wrong along the way for this mad family, but their love for each other keeps them going, and they make it to the pageant, for the maddest finale I've seen in the movies in a long long time! If you need a bit of sunshine in your life, go and see this movie. You'll enjoy it. Don't bring your 13-to-16-year-old sons. They probably won't want to admit they enjoyed it. Voici un nouvel essai sur le thème de la mystérieuse communiante. Le gagnant du concours est bien sûr Yves. Il n'y a probablement pas plus de 6 ou 7 personnes qui connaissent cette photo! Couches de peinture acrylique, effacées en partie avec de l'eau, un pinceau sec et du papier cuisine. Je n'ai utilisé que deux couleurs - un jaune citron et un magenta. 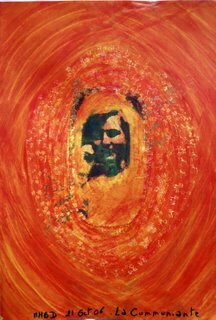 Une photo scannée, sur laquelle j'ai ajouté des couches de peinture acrylique (attention! - l'encre noire imprimée se dilue facilement - donc ne pas utiliser trop d'eau). Du "gesso" appliqué avec un petit tampon en forme d'étoiles. Et quelques touches de marqueur doré. Et pour cette dernière photo, j'ai manipulé le tout avec Adobe Photoshop, après avoir pris une photo de l'original. J'ai tout simplement remplacé les couleurs! One day this week, I was in the car going to a customer. I like to listen to RTE lyric FM when I'm in the car on my own. They do a lot of classical music, but they also do other eclectic styles. I heard this beautiful song, called "It's a long way to the top (if you wanna rock 'n' roll)". It was sung by a woman, with a voice not unlike Bjork's. When I searched for the song on iTunes, all I found was Dropkick Murphys (I have no idea who they are, but they sound awful to my ears!) and AC/DC and I was horrified! This was nothing like the soulful tune I had heard on the radio. I then googled it and found a wikipedia article (good old wikipedia!) that lists the various covers of the song, which was originally an AC/DC song, although it's hard to imagine when you hear this version. In there, I found that the Norwegian duo Susanna & The Magical Orchestra (a.k.a. Susanna Wallumrød and Morten Qvenild) had done a cover version of it in 2006. I'd never heard of them before, but a few more Google searches uncovered their page on MySpace.com. They look a bit weird, but the music is beautiful. Have a look at their page, and you can listen to the song there. I hope you like it. One morning, when we were in New York , we were walking through Madison Square Park, just besides the Flat Iron Building. We saw this young man releasing trapped mice from a couple of green boxes he had. The mice were tiny, and looked a bit bewildered. They went hopping their merry way, looking for somewhere to hide behind a tree. Actually, they may have looked merry, but I'd say they were stressed out, emerging from a warm building into an open space with squirrels, dogs, birds, cars & people. We asked him where they had come from. They had been trapped in his office, he said, and he was the lucky employee whose job it was to trap and release them humanely. They were so cute you could understand why nobody would want to kill them. But you have to wonder about their chances of survival, in the middle of a small park in the city. The young man's theory is that the mice will have made it back to his office faster than him! If you want to find out more about pest control, check out the New York State Integrate Pest Management Program website. There is a section about live trapping. Here is an extract: "Live trapping with box traps or glue boards may be used for monitoring and for removal. The technique raises legal, ethical, and biological concerns, especially with exotic species such as the house mouse and Norway rat; these issues are discussed in the "Beasts be gone!" brochure." I'm happy to report we have had no mouse in our house since we got Willow. He's brought back a few mice he'd killed, and also a rat(well dead, thank god), a few years ago. He also catches the odd bird, but seems to be getting lazier year by year. Or maybe the mice and birds are avoiding our garden. Remember Al Gore? He was vice-president to Clinton before 2000, then he lost the presidential election to George W. Bush in 2000. Recently, you may have heard of him in the news, with the documentary "An Inconvenient Truth". We watched it on the plane on the way back from New York last week, and it was gripping. 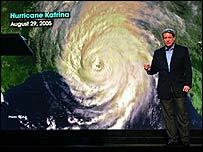 Since losing the election to Bush, Al Gore has gone on a crusade to explain the facts of global warming, and to shake up public inertia about it, particularly in the US. In the documentary, he explains the issues in simple terms and highlights why we need to do something about it now, if we want our children (or nieces and nephews) to have a future on this planet. He is a very good speaker and the facts and figures he presents are scary - a tale of melting ice caps ("The Arctic Ocean could be ice free in summer by 2050"), drought, heat waves, and extinction. He also exposes the political manipulations that have cast doubts over the scientific reality of global warming. When you see all these facts and figures, it's hard to keep your head buried in the sand. But the most important thing to me was how he highlighted that we can all make changes in our lives to impact things positively. It's not just for heads of states to implement Kyoto agreements or not. It's up to each one of us to makes changes, and reduce how much CO2 we produce. One small thing we can do, for instance, is to unplug our mobile phone chargers from the socket when we're not charging our phones. Here is a bit from his website: "Even when turned off, things like hairdryers, cell phone chargers and televisions use energy. In fact, the energy used to keep display clocks lit and memory chips working accounts for 5 percent of total domestic energy consumption and spews 18 million tons of carbon into the atmosphere every year!" Brendan and I felt so strongly about this after watching the movie that we have started taking some of the recommended actions. With a house full of computers and electronic devices, we've got quite a bit we can do. I calculated my "personal impact", and found to my horror that I was well above the average in terms of CO2 production - and that's the American average! Check out www.climatecrisis.net for more information and ideas about what you can do. Le seul anniversaire ce mois-ci! Je n'ai pas envoyé de carte, donc voici une aquarelle "faite maison" - juste pour toi! Je l'ai intitulée "Waves onto the red shore". Have you ever heard of Jean-Philippe Smet? Have you ever heard of Johnny Hallyday? If you've never heard of him, don't bother reading this post. It's a French Pop/Rock Culture thing! Some of you may disagree with the word "Culture" in there, but it's part of my culture, so don't knock it. I guess you have to grow up immersed in it to appreciate it. Most of the stars of French culture seem to endure well into their 60s and beyond. Think Michel Sardou (I'll refer you to my Connemara post), Gilbert Bécaud (my September Morn post), etc. This is a very cultural blog, underneath it all!! Anyways,.... Johnny Hallyday is one of the big stars of French Rock. He's about 60 and has sold millions of records. His real name is Jean-Philippe Smet, and us Belgians like to highlight that he comes from an area near the Belgian border (actually I just read on wikipedia that he was born in Paris, but that his father was Belgian - so we can add him to the list of famous Belgians). I never particularly liked him - actually, I can only think of one song by him "Quoi ma gueule? Qu'est-ce qu'elle a ma gueule?". The first one was "The wind that shakes the barley". It's a movie about the Irish war of independence and the civil war. To be honest, I didn't think much of it. It had got big praise in all the papers, but I felt that the core premise of the movie, i.e. that families were split apart by the civil war, wasn't developed very well. Anyway, I'm digressing again. It didn't do much for me. 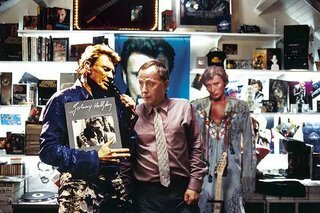 The second movie was "Jean-Philippe", a French comedy in which the main character is a big Johnny Hallyday fan, gets a knock on the head, and wakes up in a parallel universe where Jean-Philippe Smet never became a big star, never became Johnny Hallyday. It's very French, but Brendan enjoyed it too, so I think it translates well. It's very funny, and Johnny Hallyday, who plays himself in the movie, is really dead-pan. It's hard to know if he is a good actor or if he really is like that. So, even if you've never heard of Johnny Hallyday, I'd say you'd enjoy it. Et pour ceux d'entre vous qui veulent le résumé en français, le voici: Jean-Philippe. Et voici l'article wikipedia sur Johnny Haliday: article wikipedia. One of our favourite restaurants in New York was Minado's, a sushi and seafood all-you-can-eat buffet on 32nd street. 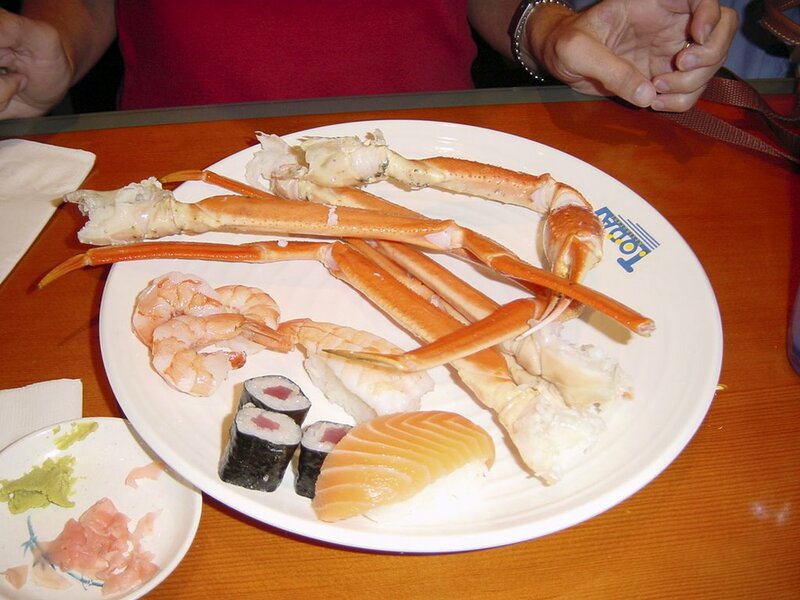 It used to serve a wide range of fresh sushi and sashimi, along with cooked seafood, crab claws and prawns. The fact that it was only 2 doors down from our hotel was an extra bonus! So it was with shock that we realised on our first day that it was no longer there, and was replaced by a restaurant called Todai! However, when we went in, we realised that little had changed inside. Actually, the only difference we could spot, apart from the name, was the fact that they now have an attendant to serve ice-cream, rather than letting customers help themselves. Apart from that, it's exactly the same - a long buffet with dozens of sushi and sashimi options, delicious crab claws, a wide choice of hot dishes, plenty of desserts presented in single-mouthful portions (so you can try a bit of everything, and go back for more). Heaven! 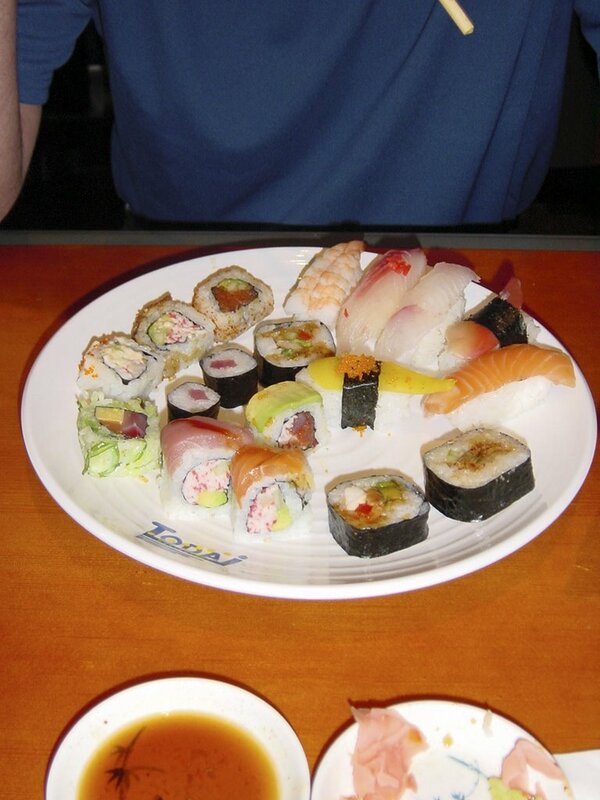 As you can see from the plate on the right, Brendan is an enthusiastic convert to sushi! My favourite is the big crab claws. I'm a very tactile eater (in other words, I like to play with my food). We enjoyed it so much, we went 3 times (in the 6 nights we were there). For those of you wondering where I disappeared in the last week - we were in New York for a well-deserved break. This was my fourth time in New York. I had been there with Ann for 2 days many years ago, and I've now been there with Brendan 3 times. I just love it. There is such a buzz around the place. There is so much to see. The food is great. The shopping is endless. I love the parks. I love the museums. I love the architecture. I love the Manhattan skyline. I still remember the first time I got there - Ann and I had taken the train from Boston. It was September I think and the trees were in their full fall colour, and we had a wonderful view of the Manhattan skyline as the train pulled into the city. One of my favourite spots to look down at the city is the rooftop terrace at the Metropolitan Museum. There is always an interesting exhibition there, and it's a great excuse to discover a few interesting paintings. 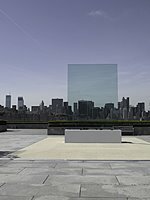 But if you're not into art, head straight for the rooftop, sit on a bench and enjoy the view. "Clear Sky Black Cloud", which we missed as it only happens at 12 noon, and we arrived later. It's a black cloud produced by a fired shell. Mmmmm. Not sure about that one. I guess you'd have to see it. "Transparent Monument", a big piece of plexiglass with dead birds at the bottom. The birds are not real by the way, but they look pretty convincing to me. Again, Mmmmm. It's art, Jim, but not as we know it. Although, on second thought, if you look at the whole view seen through the pane, it's stunning. 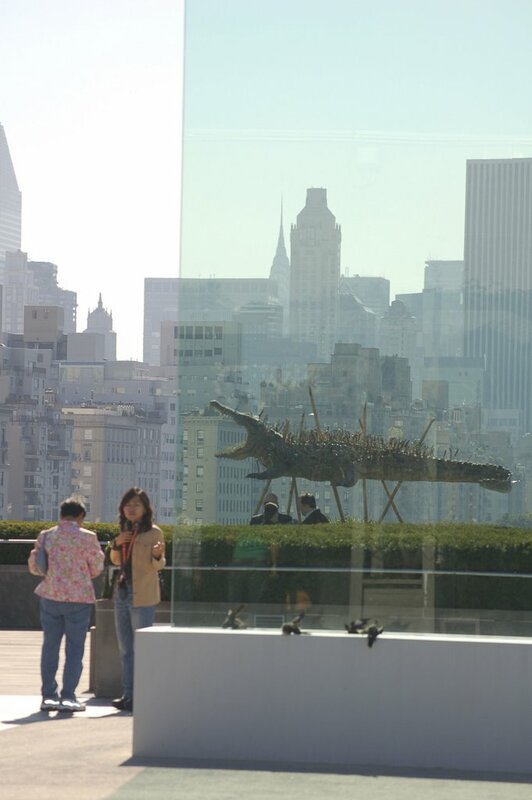 So, maybe the idea is that the art is not just the plexiglass and the dead birds, but also the Manhattan skyline. If that's the idea, then it works for me. "Nontransparent Monument" is a big wall relief. It's packed with 69 carvings of all sorts of things. 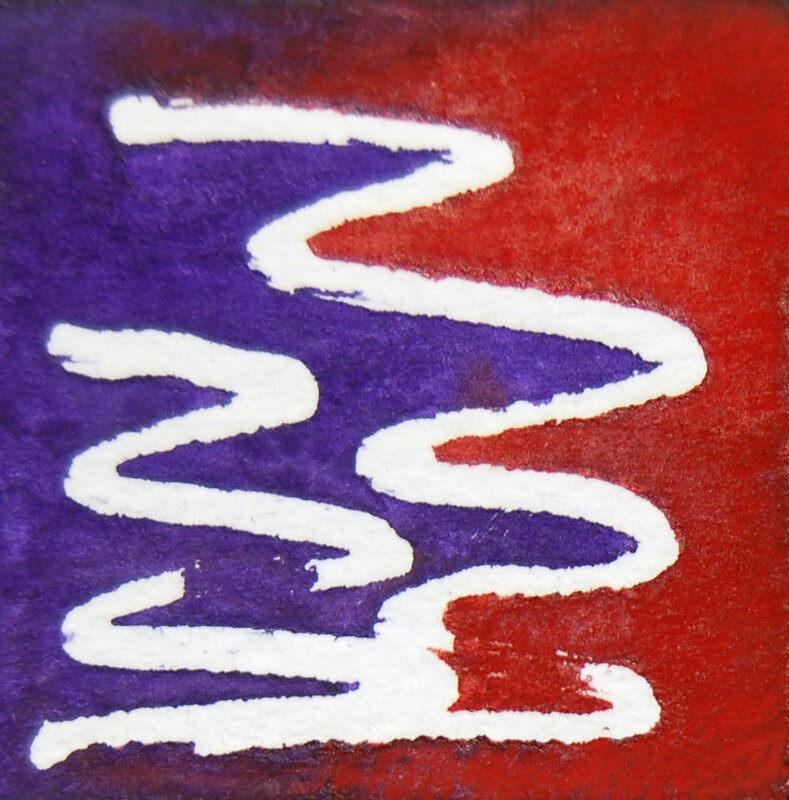 They are supposed to depict aspects of our lives after the events of September 11, 2001. Go and have a look and spot the cloned dogs! "Move along, Nothing to See Here" is two big crocodile sculptures, with all sorts of knives, forks and other sharp objects stuck on their backs (all objects confiscated at airport security checkpoints). It was big and cheeky and visually stunning. I liked it. 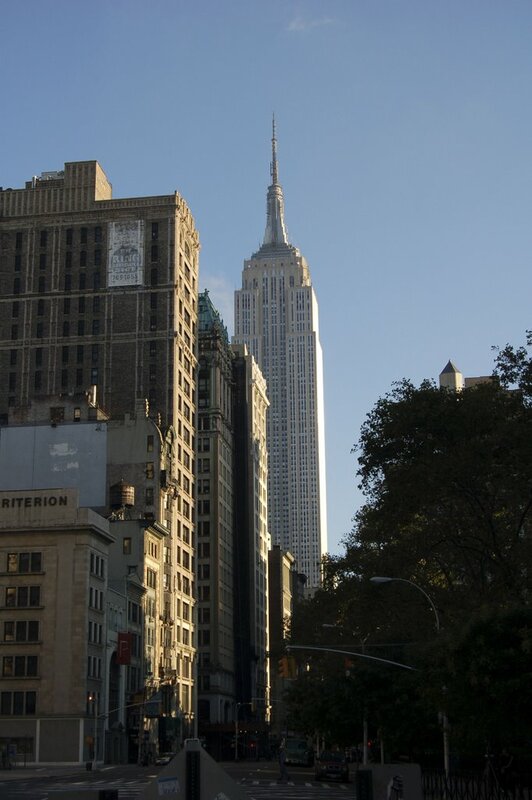 More about New York in future posts! I have tried another recipe from Aine McAteer's book - I think this is the first time in my life that I actually cook more than one recipe from a cookbook. It's great to have the time to try new things, and to develop new interests. I always liked the miso soup in Wagamamas, and I'm sure I had it on the couple of occasions I was in Japan, so I was keen to try the recipe. 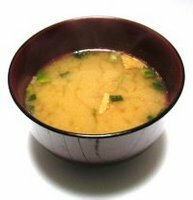 She has a recipe for dashi broth, with a number of different variations. Apparently, dashi broth is the foundation for a lot of Japanese dishes. What I used was water, kombu (a type of seaweed), shiitake mushrooms, miso paste, silken tofu and spring onions. Very easy and very tasty. 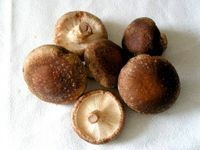 I could not find dried shiitake, so I used fresh ones instead. Probably more expensive, but it was tasty. The silken tofu comes in a really neat package - it's in a tetra pak, like a milk carton. You open it on one side and then slide the block of silken tofu out and cut what you need. The miso paste was hard enough to find, as I didn't really know what I was looking for. In the end, I found it in a health-food shop. It's packed in a plastic pouch. It looks a bit like bovril and you use it in the same way - disolve it in warm water and it's ready! We went to the pictures yesterday - The movie we chose was "The Queen" with Helen Mirren in the role of Queen Elizabeth II. We both enjoyed the movie, which explores the Queen's reaction - or rather lack thereof - when Diana died. It shows her concern for her grand-children, but also it shows how out of touch with the feelings of the British public she was. The movie shows how Tony Blair, then just elected Prime Minister, worked to get her to realise what the country expected from her. Helen Mirren is superb in the role. The other characters are a bit harder to take - the actor who does Tony Blair looks very young, but then again, I guess he was; the actress in the role of Cherie Blair looks far too pretty, and the actor who did Charles looks quite like him from the back, but nothing like him from the front. It's interesting that Helen Mirren has played the role of both Queen Elizabeth I and Elizabeth II. I loved her in Elizabeth I. The movie, which was on TV a few months ago, shows her passion for her country. Visually, it's a stunning movie - the costumes alone are worth watching it for! If you want to find out more about the British Monarchy, have a look at their website. There is even a recruitment section, where you will find that they are looking for a Director of IT and Telecommunications, at £70,000 to £ 80,000 per annum, plus benefits! - Closing date for applications: 16 October. There are plenty other opportunities, including that of Linen Keeper!